Waterman pens are well-known for their elegance and sophisticated looks and feel. They have been inspired by aviation as well as sailing. The influence of gentle curves and the French je ne sais quoi are evident as well. Lewis Edson Waterman had lost a sales deal with a client due to a leaking fountain pen. He ended up inventing the “Three Fissure Feed’ system which helped prevent discharge of ink while the pen was used. His first Waterman pen was patented in New York in 1883. Waterman had started off as The Ideal Pen company and went through a renaming process in 1888. The pen clip, as well as a safety feature of completely a being ink flow proof pen, were invented in 1904. The company is known for the creation of pens with clips. These clips were added so that the pens could be held in the pocket of the user. Waterman entered the Newell Brands group in 2001 which owns Parker pens as well. 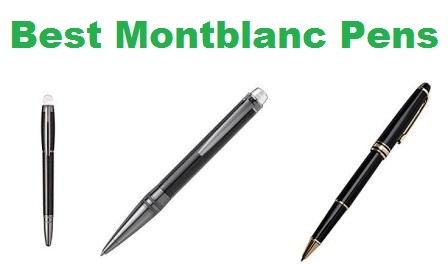 However, the company has decided to place Waterman at a higher level as compared to Parker pens to directly compete with the luxury pen brand Montblanc. 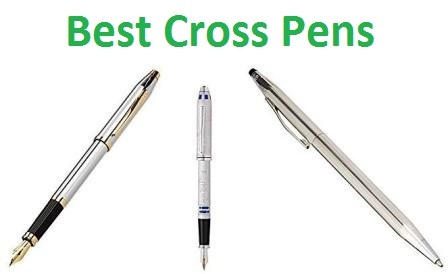 Check out our complete guide about the best parker pens. Waterman pens serve as great gifts in the high-end market. Waterman’s reparation has strong foundations on the reservoir-based fountain pens. These are the pens that had become very popular towards the end of the 19th century. As more and more manufacturers entered the market in the 20th century, Waterman stuck to its original value proposition and it is this originality that has that has now seen a resurgence of interest as the new generation which even though is an avid user of digital communications has realized that indeed, the traditional and rather conservative but extremely elegant and sophisticated styling of the Waterman pens has got the underpinnings of a design work of timeless quality and excellence in manufacturing. Waterman pens are manufactured with the finest possible materials. Some of the options that are available are aluminum, steel, silver plate, enamel or lacquer. the Waterman pens are indeed premium pens of high-quality which are made of selected materials. The twist mechanism is used to keep the needle point as safe as possible when the pen is not being used. Similarly, caps are used for the same purpose. The pens tend to remain in working condition for a very long time due to these safety mechanisms of twisting or capping the pens while they are not in use. Waterman pens permit two different options to corporate customers and these are the laser engraving and pad printing options. Company’s logo or brand images can be placed on these pens. Pad printing allows for the colorful company logos to be printed on the pen in the original colors. Laser engraving, on the other hand, gives an extremely elegant look as the imagery is etched into the surface of the body of the pen. While Waterman pens are easy to ship due to their small size, yet, to create an atmosphere of excellence, corporate gifts of these pens are usually handed over in person for that very special personal elegant touch. These pens are usually enclosed in the branded pen box to enhance the appeal of the gift as well as its presentability. Both the Reservoir and the Rollerball types are available. The Waterman Collection includes Elegance, Exception, Carène, Charleston, Perspective, Expert and the Hemisphere Series of pens. Elegance series is more of a persona jewelry series. Its gracefully built and the design is creative, fine and intriguing. Both Goldsmith and Silversmith skills are utilized to create this luxury pen which is truly a precious pen. Technical ingenuity is at the center of exception. The subliminal experience of using this good-looking and brilliant pen is indeed exceptional. The inspiration that created this pen is evident in the elegant and charismatic lines. This is an extremely innovative pen. It resembles a luxury boat in design and has been crafted with noble materials with attention to very fine detail. A leisure cruiser comes to mind while looking at the sleek lines of its extremely fluid design. Other designs might resemble the billowing sails of a luxury yacht. Charleston takes the user back into the past, however, it is still compatible with the modern times. It displays an Art Deco style which seems to recall the cocktail chic found in the Roaring 1920s as well as the sign language used by the movie stars of silent films era. Its design is aerodynamic and inside is a marvel of the latest technology. This pen has been inspired by modern architecture. The parallel lines in it represent limitless imagination. Creativity is reflected in its crisp exterior and when used its presence cannot be ignored by the user. Extremely Parisian in style, it is a cigar-shaped pen manufactured from the finest materials. It reflects the creative spirit of the user hiding under his executive exterior. Reflective of one’s vision and flair, it enlivens the professional life of the user with its classic Waterman touch. It exudes sophistication. Elegance is the name of this pen. It is innovative and reflects simplicity in its timeless lines. The design is clean, and it inspires the user to be creative and imparts a delightful writing experience. Ideally suited for imaginative people. Possessing clean lines and made from modern materials, it has amazing angles which resemble a shining skyscraper. Made in France by Waterman, it reflects the originality of the genius of the founder Lewis Edson Waterman. It boasts a sophisticated yet generous stainless-steel nib and displays a ‘W’ as a mark of unmatched creativity and high-quality. Combination of rich gold trim and black lacquer, it contrasts strikingly with the innovative and visionary world of today. For a Waterman perspective experience, this is an ideal choice fountainpen. It would serve the user in his/her lifetime and the user would be able to savor a transformational writing experience with this extraordinary piece of writing pen. Amazing angles interacting with clean lines and constructed from the finest and most modern materials, the design element is very powerful and is a symbol of elegance, efficiency, and excellence, all embodied in a single product. This beautifully crafted pen is representative of the shine and glitter of a modern metropolitan skyscraper and tends to be targeted at the modern, urban lifestyle as well. The beautiful barrel with the stainless-steel nib showcases the art of the creators with its pure and graphic lines that seem to be breaking outwards and pushing the boundaries. The pen indeed gives the use a novel and modern perspective at writing. The Waterman Black with Golden Trim, Fountain Pen with Medium nib and Blue ink (S0830820) comes with a 3-year International warranty. Its limited warranty covers defects of material and workmanship. 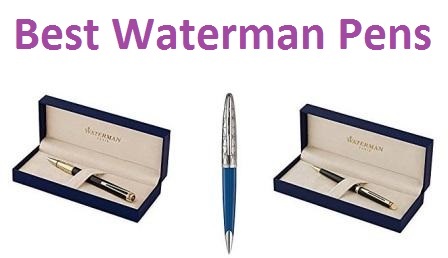 If found defective within the warranty period, Waterman would either repair the writing instrument or replace it altogether with a new one of the same type without any cost to the user. This warranty is extendable by another 2 years if the pen is registered at the manufacturer’s website. The pen is in the form of a silhouette which is cigar-shaped. It has been manufactured with very fine materials which serve to expose the executive persona of the user and creates an aura of creativity around the person carrying it. It has been manufactured in France and epitomizes the unmatched genius of the founder of Waterman pens, Lewis Edson Waterman who was the inventor the very first reliable, non-leak fountain pen in the world in 1883. Boasting a sophisticated yet generous nib made from stainless steel, it displays a ‘W’ majestically as a solid mark of both immense creativity and quality. A Black lacquer cap made of satin and matte in appearance is coupled with the barrel which has been plated with palladium along with an engraved decor. There is also an angled groove which has been carved deep to make the design look very sophisticated. 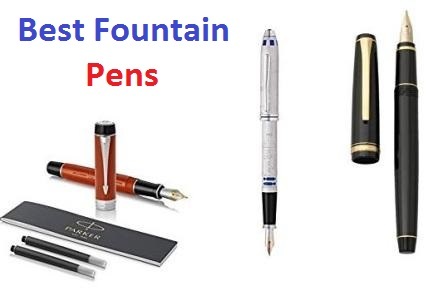 The pen is normally warranted for 3 years whereupon as a result of the limited warranty, the company shall either repair it upon a defect or simply replace it. However, in case the user is able to buy it from the manufacturer directly, the company would increase the warranty period to 5 years. The Waterman Carene Ballpoint Pen Pouch Blue Obsession Gift Set comes with a free-of-charge pouch for carrying and holding the pen and keeping it safe when not in use. This is a gift set which is a limited edition. It boasts a beautiful mix of shining gunmetal and blue colored lacquer. The design is emphasized by its clip which has a palladium finish along with a chiseling that appears to be crisscrossed. The nib is so perfect that simply does not dry out. It produces fluid lines that are unmistakably flawless. The twist mechanism employed in the pen can be retracted. The pen weighs 12 ounces and its dimensions are 8.1 x 5.6 x 1.8 inches. Post-1883, Waterman has always endeavored to design extremely reliable as well as stylish writing pens. With creativity honed over the years, Waterman pens have come to reflect the persona of the user including his character and temperament. The pen makes very good use of the fine materials as well as exquisite colors to perfect the styling and design. Waterman is reflective very much of French styled designing. Carène seems to be flying high when it comes to innovation. The pen portrays the design of a luxury boat and has been crafted with a vision that is cutting-edge on all counts. Noble materials have been used to craft it and the designers and artists have kept its curves to resemble the sleek lines exhibited in the cruise liners or sometimes to the sails of a luxury yacht billowing in the wind. Possessing and using this pen is very much like going on a luxury yacht cruise or journeying on a cruise liner. The services and support provided by the Waterman Company match the quality of the pen itself. Warranted normally for 3 years, the limited warranty extends to 5 years upon purchase from the manufacturer. The pen is warranted to be either repaired if found defective or is replaced altogether. This pen has been designed keeping the shiny skyscrapers of metropolitan areas in mind. The clean lines on the pen and the amazing angles interplay with each other in the presence of sculpted faceted finishes. Designed and manufactured in France with excellent crafting skills, the pen closely displays the original reliability of Lewis Edson Waterman when the pen genius founded the company in the 19th century. This pen does not dry out and is able to produce lines without any flaws. Its ink can be trusted anywhere at any time and allows for spontaneous expression to the user. It has a rich trim of gold in the presence of black lacquer which gives rise to the striking black and gold eye-pleasing and innovative vision. The stainless steel nib provides for highly precise writing. 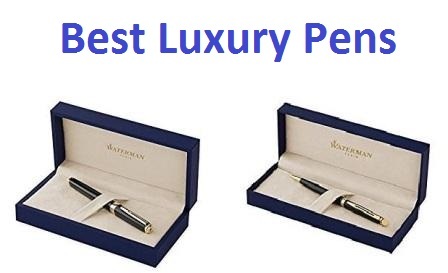 The pen has been hand-polished and is sold contained in a gift box of premium quality. The pen is available in 2 different types of trims; chrome or gold. The ink is also available in 2 classic colors. It exudes the same awe and beauty that the metropolitan skyscrapers do when they glisten in the sunlight and appear to be subliminal and fearless. Al of this kind of beauty has been condensed in this writing instrument with pure elegance. The Waterman Perspective Ballpoint lets the user fill a blank page with finesse and the control of an expert. The barrel of the pen is ultra-shaped in terms of aesthetics while the nib appears to be crisp. These beautiful and expert traits are able to transform the user experience in writing from a purely ordinary one to a literal signature experience. Like the skyscrapers dotting the horizon, the Waterman Perspective pen aims to reach the sky. This Waterman pen is warranted for 3 years for defects under a limited warranty. The company warrants to repair the pen if found defective and in certain cases, would replace it with a new one. The warranty goes up to 5 years if the pen is purchased directly from the manufacturer. This pen is reflective of the Parisian styled designing and craftsmanship at its best. The silhouette is cigar- shaped and the combined use of many fine materials gives an air of an inspirational and creative executive style. This Waterman rollerball pen combines the age-old liquid ink tradition with the comfort and convenience of modernity. The deep black lacquer elegantly merges into the golden sheen of the trim complements of this extraordinary pen. This pen, like its companions, is very much in line with the original reliability and skillfulness of the original pens invented by Lewis Edson Waterman when he founded the Company. The refill for the pen is not fitted to the pen but is delivered placed in the case of the pen. The pen is crafted by hand by craftsmen in France and then assembled. It gives the user very precise writing capability and as such its sophisticated design is ideal for this purpose. The presentation is made in a very luxurious gift box. The purchaser has the option of going to the chrome or gold trim. As it is crafted by hand in the heart of France, this pen brings along a Parisian styled sophistication to the user and thus to his/her business day. This Waterman Expert Rollerball pen enables the user to exude a very passionate and creative spirit underneath the business persona of the executive. The use of a wealth of noble materials in combination with a cigar-shaped silhouette which enhances its luxurious appeal, the rich design of the pen gets positively emphasized. Its subtle chemistry between its elegance which is undoubtedly timeless and its modern touch suitable for today’s lifestyle ensure that this pen is as good for a solo individual as much as it is for an executive board member. Normally available with a 3-year limited warranty, it is extendable to 5 years if purchased from the manufacturer directly. The limited warranty allows for repair or replacement of the defective pen. The pen has been manufactured in France using the finest possible materials by craftsmen expert in the art of crafting beautiful pens that enhance the appeal of the user persona and bring out the hidden qualities of innovation and creativity in his/her spirit which lie beneath the external business personas that the person normally exudes. The beautiful surfacing of creative and innovative elements of the persona become evident in the way the person carries the pen, uses it and in the way, he/she conducts the spontaneous or planned expressions in writings. The age-old and traditional liquid ink gets an infusion in spirit from modernity and the convenience of today’s lifestyle which emphasizes comfort and the two are immaculately blended in this fine pen. The palladium plating of the trim and the brushed stainless steel portray a striking contrast which enhances its appeal and the broad ring on the pen is reflective of the strength of the pen and its durability and reliability. The purest of the timeless tradition of the use of liquid ink which gives an aesthetic element to one’s handwriting, the pen succeeds in combining this heritage with the convenience and comfort of modern life which demands urgency and speed in expression and writing. 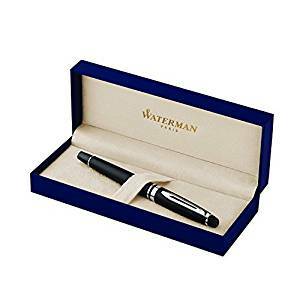 The Waterman pen enables the user to use this Rollerball pen in such a way that every word is written appears to be deliberate, as well as intimate and these effects are distinctively enhanced by the use of an extremely refined nib which exudes creative finesse and a flowing movement that would enamor the user to this elegant pen. It is ideal for those very special occasions when the user is graduating, celebrating an anniversary, or perhaps a promotion in his/her career, etc. Such moments are penned down with the same celebratory spirit by the use of this luxurious pen exuding endless creativity while at the same time representing an age-old and established tradition. 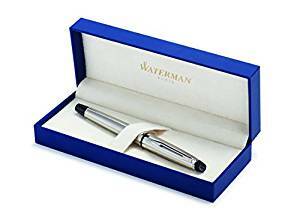 Waterman warrants the pen with a 3-year warranty which is extendable to 5 years in case the purchase is made directly from the manufacturer. The defective pen is warranted to be repaired or otherwise, replaced by the company. The pen is manufactured in France with an expertise that has been polished and refined over years of fine work and searching for just the right materials to convey the right persona of the user at the most important moments. The silhouette of this pen is shaped on the pattern of a cigar which gives it a unique and luxury look and feel. While designing this pen, the craftsmen have kept in mind the subtle underpinnings of the user’s routine business persona camouflaging the creativity of the human spirit that lies deep beneath the external persona. Technically superb, carrying the tradition of traditional usage of ink and combining it with a modern, to-the-point and matter-of-fact approach, the pen is an ideal combination of these two opposing lifestyles. However, these are finely blended and utilized in this pen. These elements are further emphasized through the use of a matte black which is very novel and unique and the trim which is palladium plated. Such materials and their fine usage enhance the elegance, and appeal of the pen. The pen is hand-crafted for highly precise writing and is sold in a gift box that epitomizes luxury and elegance at their best. Users are presented with the option of taking the gold or chrome trim. The users can give an altogether give a new meaning to their writings with this highly sophisticated and hand-crafted Rollerball technology-enabled pen from Waterman. The pen enables the hidden innovative spirit encircling creative spirit underneath the external persona of the user. For this transformation to take place, Waterman has made very good use of a wealth of the finest possible noble materials available in the world to enhance the richness in the design of the pen. The Expert Collection and its Rollerball-technology enabled pens are a mysterious mix of the compulsions of modern urban living and lifestyle and the age-old and proven traditions that have developed and strengthened over the years giving humanity its experience and wisdom. While a solo businessman or woman would simply love to make use of the elegance of this wonderful blend, the boardroom executive would not be far behind in wanting to use this amazing mix to his/her advantage and create an aura around himself/herself that would reflect a blend of tradition and modernity in a single writing instrument. This Waterman pen carries a regular 3-year warranty. If the pen is, however, purchased from the manufacturer, this would extend to 5 years. Defective pens would be either repaired or replaced by Waterman. The Ballpoint Technology from Waterman ensures a silk-like smoothness and precision like that of a scalpel when it comes to writing with this pen. The Waterman Ballpoint nib lets the user produce beautiful and flawless lines of writing, the appearance of which would be no less elegant than the fine words used by the writer to capture planned or spontaneous expressions. The Ballpoint nib does not dry out. It does not cause embarrassment to the user and does not bleed causing blotting and staining on hands or elsewhere on paper, etc. The pen is characterized to be extremely impressive when it comes to user expectations in terms of precision in writing for those wonderful and memorable moments where every movement of the pen on the paper is reflective of the celebratory spirit of the user and when every moment is worth capturing for posterity. Crafted by the finest craftsmen in France and developed to excel in highly precise writing, the Ballpoint-technology enabled pen is presented in a premium luxury gift-box. The customer has the option of choosing chrome or gold trim. This pen is not just an accessory. It should never be conceived as such. It is literally a statement that the user makes to those that he/she interacts with and to the world. 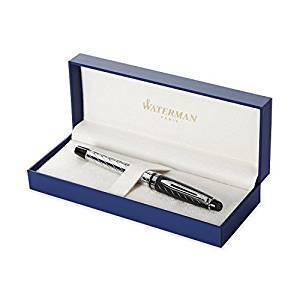 The Waterman Expert Ballpoint brings together the business executive’s world of fine and sophisticated tastes along with their traits and behavior under the compulsions of the business and general contemporary urban and metropolitan environment and the Parisian sophisticated and artistic styling that has developed over a long time. The pen thus produced exceeds all expectations of the users in this regard. With a calculated blend of fine noble materials and its beautiful cigar-like silhouette, the Waterman Expert Ballpoint shines as a writing instrument with a smart blend of age-old tradition and timelessness on one hand and the contemporary requirements on the other. IT does not matter whether the user is decorating the paper with the finest form of calligraphy or simply penning down a business agreement clauses, the immaculate performance, sophistication, and elegance would match or exceed the highest of the expectations. 3-year limited warranty extendable to 5 years (for pens purchased from the manufacturer), the defective pens get either repaired or replaced. The pen produces strikingly clear and clean lines which allow the user to write precisely and smoothly. It has a very slim clip along with a broad ring. This combination is effective in conveying a sense of timelessness in terms of the simplicity involved in the writing. The pronounced and the distinctively significant form of the writing is also clearly emphasized. Perfected by the expert craftsmen in France in line with the Lewis Edson Waterman tradition who always emphasized on reliability and precision, the pen produces lines that literally have no flaws and it does not dry out. This gives a strong sense of reliability and enjoyable dependability to the user. The concept of anytime, anywhere ink from this immaculately styled piece of perfection enables expression anytime anywhere. This spontaneity is the essence of manufacture of this remarkable pen. It weighs 6.2 ounces and its dimensions are: Colors available are black and gold. 6.9 x 2.7 x 1.5 inches and the point type is medium. This product is the result of 130 years of Waterman experience with designing pen for the most important people for their most important forms of expressive writing or business agreements, etc. Waterman has indulged in attempts to blend together d. design excellence a la tradition with creativity and innovation. This has indeed led to the most sophisticated and remarkable writing instruments. The company makes sure that each and every design is unique to itself. By itself, each of their pens is a work of art on its own merit. Bringing out the desired persona in the user and projecting it across to the world is a hallmark of Waterman pens and this pen is no exception. It is slim but very powerful and allows both precision and pleasure of writing to the user. It elevates the writing experience of the user to new heights. The slim clip and the broad ring enable a sleek design which is empowered by an engraved nib which exudes an expert touch in manufacturing. The use of this Hemisphere Ballpoint enhances the clarity as well as beauty in one’s writing to the points of perfection. Backed by a 3-year limited warranty, Waterman can increase the coverage to 5 years for pens directly purchased from the manufacturer. Pens which are found defective will be either repaired or replaced. The product has been designed in France and manufactured as well. The design of this immaculate pen is both expressive as well as modern. It has been inspired by elements of modern architectural trends and as such represents and encapsulates the fine elements of modern-day architectural features and designs within its design and silhouette. The pen uses deep blue Waterman styled lacquer and is available in the realm of Rollerball technology from Waterman. The pen is presented elegantly in a premium quality gift box which is 14 inches in length and 18 inches wide. The gauge of is 100 thick. It has a nib made of stainless steel that allows for very precise handwriting. The pen has been polished by expert polishers by hand and comes encapsulated in a gift box. Gold and Chrome trims are available for this pen. Two options for classic ink are available. It is designed for all those users who do not want to be a part of the ordinary. It allows the user to rise above the crowd and thus avoid becoming a part of the mediocre. The inspiration of this pen is from the metropolitan architecture and more specifically the glistening skyscrapers standing tall as seen on the horizon of modern cities. The Waterman Perspective Rollerball is a symbol of unmatched beauty and a presence that cannot be resisted like that of a skyscraper. It is extremely detailed and every piece of intricate detail is highlighted. Its writings are reflective of the contemporary metropolitan and urban designs and include the sleekness of the pen’s barrel and the amazing and precise nature of the nib. The Waterman Rollerball takes the user to heights that he/she has never reached before. The remarkable product is backed by a reliable warranty for 3 years normally, however, it is extendable to 5 years for pens that are directly purchased from the manufacturer. The warranty applies to all pens that are found to be defective and these would either be repaired or replaced by the company within the warranty period.